Now that we have completed the intitial purchasing process for Landon Homes and we are oficially, really, moving out to the suburbs to Frisco, Texas…I’m diving in to all my favorite parts of the city life; embracing them with one giant bear hug farewell. Yes, I can still drive the 20-40 minutes in the future to enjoy them, but it is just not the same when they are your backyard. With 3 kids in the city, nothing is more fun than a trolley day. the McKinney Area Transit Authority runs old style trolleys for FREE around the uptown area of Dallas with several awesome stops and sites to take in. The ride starts at the City Place transfer station near Highway 75 and runs 2 to 3 blocks into Downtown Dallas. 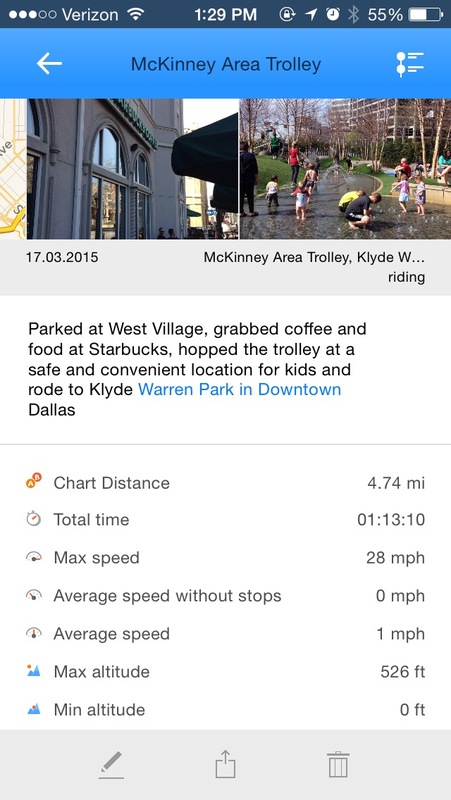 Our favorite spot to hop on is the Starbuck’s Coffee at West villiage. Why? Two very good reasons: free parking! and a safe trolley access point. Most other trolley stops, like bus stops, are just a pole on the sidewalk right off a road. Fine for me, not so great with mobile toddlers. Here, mommy can get her Chai Tea Latte, breakfast for the kids – yes my 3 year old has a Starbuck’s habit, and sit on the outdoor patio leisurely waiting for the trolley. Life is good. Getting on the trolley, you quickly realize how many years each car has seen; beautiful wood walls, intricate metal details and high step entrances. On a stunning day like today, we open up the windows and my son watches traffic and buildings pass by his view. Our destination is Klyde Warren Park; an oasis in the city built over a highway that brings downtown and uptown together in one park, for the people, but the people. My son is one of those that has to do activities the same way each time. We start at the children’s play area with water features, mist, tree houses and jungle gyms and move over to the library followed by food trucks and open exploration. I have a couple YouTube videos highlighting the childrens’ experience. First, just let me say, I am a very light packer. I like hopping the trolley, freely and without a lot of baggage – but I travel with a toddler and a baby. First and foremost, I wear the aby on my back in a carrier, my favorite carrier, a Didymos Indio Aurora. This eliminates the need for a bulky stroller. Second, I carry a Coach purse instead of a diaper bag. It is divided into two sides by a zipper pouch; one for mom and the other side for kid stuff. They no longer make that style, but Tory Burch does! What goes in the bag? A couple of Luna bars, grapes, sun block, two diapers per kid and baby wipes. Add swim clothes for each kid and a blanket that doubles as my scarf and that is it folks. Everything else I get from Starbuck’s or the park food trucks. To mark our journey, we tried a new app for my Verizon iPhone in the iTunes App store that maps your route and even allows you to take pictures along the way, Track-Kit! 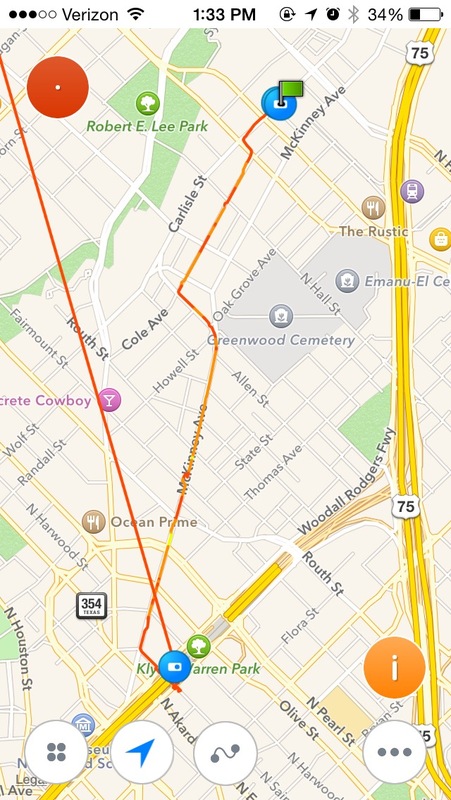 My old phone, of course, died as we were leaving the park, but I was still able to track the trolley route from Starbusck’s in West Villiage to Klyde Warren – I just got a weird line back to my house as the crow flies. One of my favorite aspects of this app was the ability to see interesting data from your trip. Never knew this fact, the trolley reaches speed of 28 miles per hour. Who knew? Area altitude was over 500 feet above sea level. For my fellow bloggers, especially the travel bloggers, this would be a fun application to use, because after you create a map with interactive pictures and note, you are able to upload them to the main site for others to see and download! 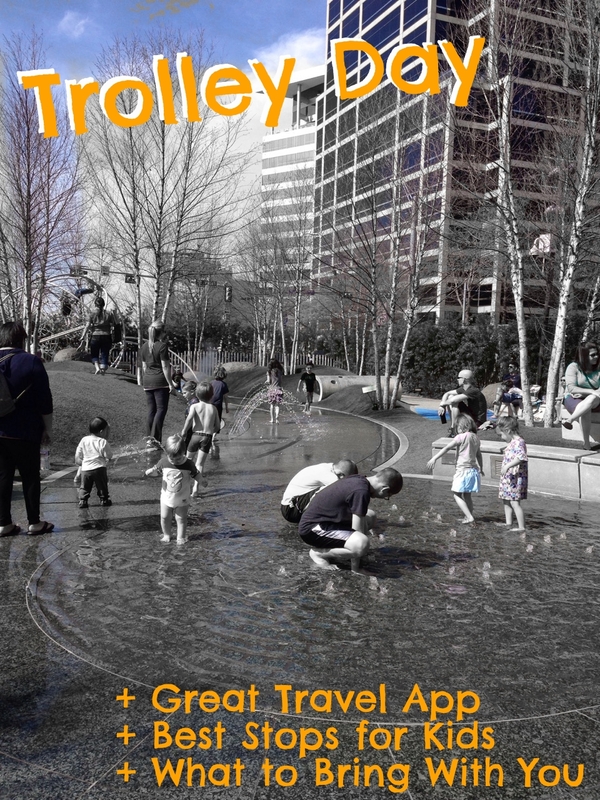 Have you ridden the trolley yet? What are your favorite points of interest along the trolley? Let us know in the comments below! Next articleWhat Mom’s Really Want on Mother’s Day – And It Is Not What You Think!